Laura offers a link to some free stencils, journal prompts and vintage photos for collage, atc's or mixed media art! 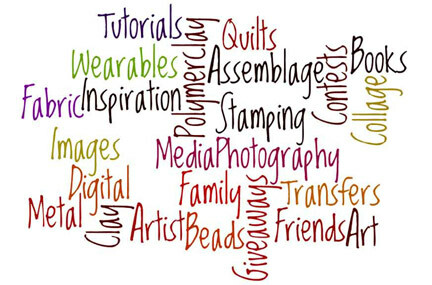 Cyndi wraps up "Seed Bead Month" with a look back at tutorials in the Beading Arts archives, from easy beginner projects to more challenging ones! Easter's around the corner, come see a quick treat June's doing with Peeps! One of The Artful Crafter's readers has developed a new, improved recipe for homemade polymer clay. Be sure to check out Eva's recipe, as well as the darling gingerbread house she made with it. Cherie makes a sculpture for her hearth.